Normally when you uninstall or remove any application which have shortcuts created, then these becomes invalid shortcuts, then ho w to restore the broken shortcuts in Windows? 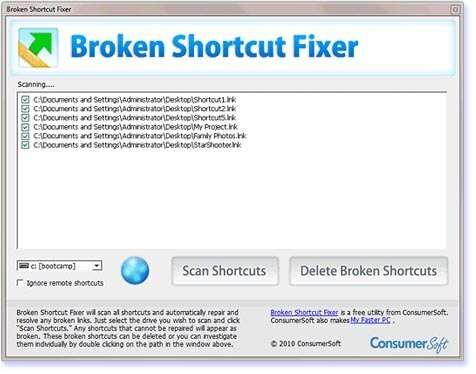 ConsumerSoft has just released Broken Shortcut Fixer, a newest freeware title offer an easy tool to scan your computer from broken shortcuts. 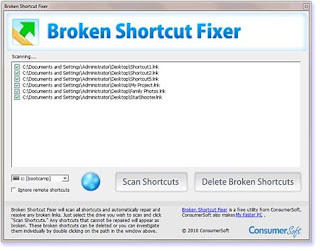 Broken Shortcut Fixer will also automatically repair any shortcuts that it can find using the Windows link resolve method. It also lets users examine or delete any shortcuts that cannot be repaired.